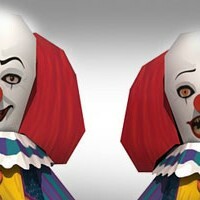 You must know about the wave of sightings in recent clown prankster and also the response given by the people. Whereas last year I was thrilled to watch clown pranks on youtube, and laughs when people fear being made fun of by the clown. I wonder what that prankster clown is thinking now, a lot of prankster clowns were hurt and even shot because they are too scary. I do not know who is right, but if the clown was shot then it was already an excessive response. About a scary clown and also upcoming Halloween, I immediately thought of the "IT" miniseries in the 90s. The clown name was Pennywise the Clown. The clown that I made into papercraft model is a 90s adaptation version from The Clown in a novel by Stephen King, with the same name. The template is consist of 3 pages, the model will has 15 cm in height or 6 inches. I made 2 version of head part which you can choose to build. 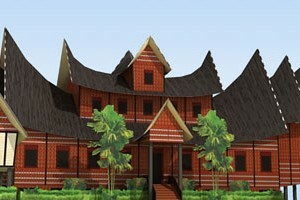 Rumah Gadang or Big House in English are Minangkabau tribe traditional house, from West Sumatra. This model was inspired by a Royal Palace at Pagaruyung. There are two styles of Rumah Gadang, one level and multiple levels. Multiple level usually found on an aristocrat house. Rumah Gadang traditionally owned by a woman in the family, and will be pass to her daughter because Minangkabau is a matrilineal culture. The house must at least consist of 5 rooms and 9 rooms for ideal. The template consist of 5 pages of patterns, the scale is about 1:105. Recommend to use 120-160 grams paper. 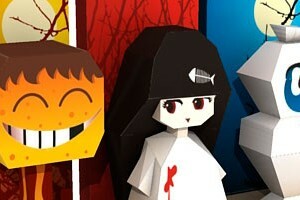 This one is a Halloween themed paper craft. Glundung Pringis (Javanese) or "Rolls and Grinds" is a type of supernatural entity, it's not like an ancient myth which apart in distance past, this creature was last seen and was reported in 1965 in central Java according to a book about Java supernatural creatures, unfortunately I didn't remember exactly the title of the book and the name of the author, but I remember it's in English and the author is an American expatriate. I also heard about this creature beside other creatures from my parent stories when they were kids in Yogyakarta. This creature is mainly a head, or whole body looks like a head. According to the book, it's not as like as many people and articles said, this creature is not a human head. It's pretty bigger than normal human head with wider mouth line, but it's not human. Its favorite playground is on the ground where bamboo leaves lies as a soft carpet under bamboo trees. Its behavior rolling around and playing on the ground. There was some encounter with human being with this creature in the wild, it rolls, stops and grinding :D, funny huh? This dancer template was submitted by Ivan vh, he recolor the original Balinese Legong dancer template with his own texture. Although he uses different pattern / batik from different part of the archipelago but it still looks beautiful and different from the original one. Built paper craft in the photo was assembled by himself. The PDF file is quite big in size (almost 6 MB) so I split it into 3 parts. I made this papertoy specially for papercraft workshop which will be held by Pelita Harapan University at their campus, November 29th. 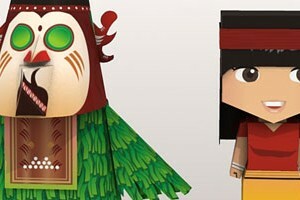 This simple papercraft only contains 2 pages for 2 characters, all are The Hudoq traditional Dayak Tribe dancers. Hudoq dance is a part of Dayak Modang and Dayak Bahau tribe rituals (East Borneo), it regulary performs after planting rice padi on September to October. Dayak people believe all their dance movement was came straigth from heaven. Dance itself is for honoring their ancestor spirits which they believe always gather around them in planting season. They believed Their ancestor came from Asung Luhung or The Great Mother who decended from the sky in the upper course of Mahakam River, Apokayam. The Asung Luhung possesed god's power who can summon good and evil spirits. The good ones, Jeliang Tok Hudoq were sent by Asung Luhung to help human with their knowledge and share seeds for planting. Because of Hudoq frightening appearance they have been told to wear disguise as half man and half bird creature.